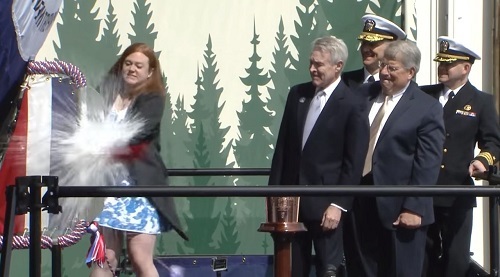 WASHINGTON D.C. — The Navy christened its newest Virginia-class attack submarine USS Washington (SSN 787), Saturday, March 5, during an 11 a.m. EST ceremony at Newport News Shipbuilding in Newport News, Virginia. The ceremony is available to view at http://navylive.dodlive.mil. Elisabeth Mabus is the ship’s sponsor. Secretary of the Navy Ray Mabus will deliver the principal address. The future Washington is the 14th Virginia-class nuclear submarine and the fourth Virginia-class Block III submarine. The ship began construction in 2011 and will commission in 2017. Block III and later Virginia-class submarines have a redesigned bow which feature a water-backed large aperture bow (LAB) sonar array and two large diameter Virginia payload tubes (VPTs), each capable of launching six Tomahawk cruise missiles. The two VPTs replace 12 individual vertical launch system (VLS) tubes utilized on earlier submarines. The VPTs simplify construction, reduce acquisition costs, and provide for more payload flexibility than the smaller VLS tubes due to their increased volume. The Washington will have the capability to attack targets ashore with highly accurate Tomahawk cruise missiles and conduct covert long-term surveillance of land areas, littoral waters or other sea-based forces. Other missions include anti-submarine and anti-ship warfare; Special Forces delivery and support; and mine delivery and minefield mapping. So far, 12 Virginia-class submarines have been delivered, 11 are in construction and five are under contract. 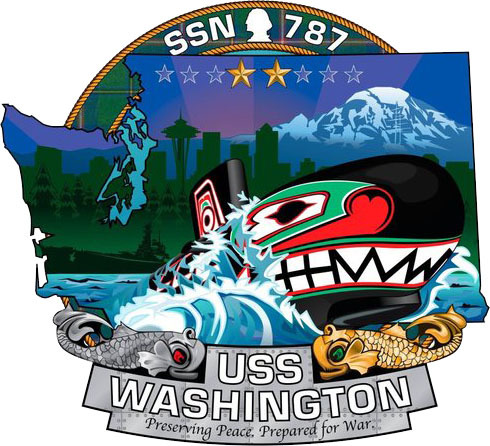 The future Washington is the third U.S. Navy ship to be commissioned with a name honoring the State of Washington. The previous two ships were a World War II battleship (BB-56), decommissioned in 1947, and an armored cruiser (ACR-11) which served under the name from 1905 to 1916. Virginia-class submarines weigh 7,800 tons and are 377 feet in length, have a 34 foot beam and can operate at more than 25 knots submerged. They are built with a reactor plant that will not require refueling during the planned life of the ship, reducing lifecycle costs while increasing underway time. These next-generation attack submarines provide the Navy with the capabilities required to maintain the nation’s undersea supremacy well into the 21st century. They have improved stealth, sophisticated surveillance capabilities and special warfare enhancements that will enable them to meet the Navy’s multi-mission requirements. Additional information about Virginia class submarines is available online athttp://www.navy.mil/navydata/fact_display.asp?cid=4100&tid=100&ct=4. Love the crest and the look of the sub!